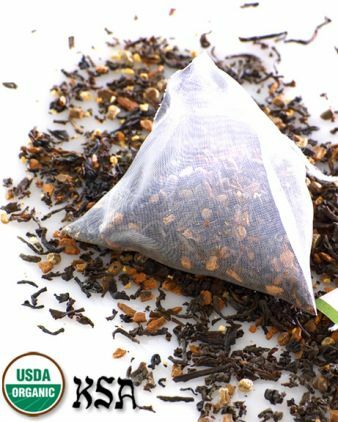 Chai is typically made with black tea and a variety of sweet flavors such as cinnamon and orange peel. Two leaves and a bud offers a traditional chai that starts with real Assam tea (not cheap “blending tea”) and adds cinnamon, clove, and cardamom spices. Fabulous with milk and honey! Add some frothed milk and Vanilla Sugar to make an awesome Chai Latte! OK, I have to admit that I’m a bit biased when it comes to chai. As a tea artist, I spent about a year creating my own chai blend, and I’m quite proud of it. But that doesn’t mean that I can’t have an appreciation for other chai blends as well. This is a fairly simple, straight-forward chai blend – a good, solid Assam tea base with the basic spices: cinnamon, cardamom and cloves. However, the simplicity of this blend should in no way indicate that this tea lacks in flavor, because it doesn’t! The Assam tea is malty and rich, and gives this tea a bit of tooth! The cloves are very pronounced in this blend. The spices are not spicy hot, but they do add a pleasant warmth to the cup. I enjoyed this tea as a latte (and used my handy-dandy Aerolatte Frother – which I also purchased from Two Leaves and a Bud a few months ago! ), although I did not steep the tea in milk. I find this to be a rather messy endeavor, and I’d rather not deal with the clean-up. Instead, I brewed the tea in water (using a bit less water than I normally would for a sachet) and then zapped a splash of milk in the microwave to get it warm (but not too hot). I then whipped the milk into a very rich froth with my Aerolatte Frother and poured the brewed tea over the foamy milk and stirred in a drizzle of raw honey. The result is a cup of creamy goodness: warm and spiced and delicious.